Girls Clothes - Fun Fashion: All Day and All Night! We have the the looks your little girl needs to rock around the clock. All day and all night your child will Just Love wearing our soft and stretchy fashions. Looking for sporty short sets? We’ve got ‘em. 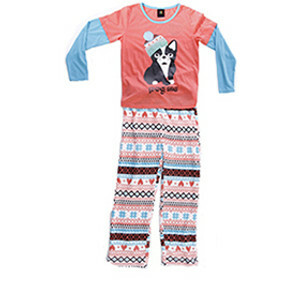 Want soft, cozy jammies? They’re here! Need a sporty girls jacket? You’ll find it at Just Love. That’s because, at Just Love Fashion, we’re crazy about kids, and we’re committed to designing the kind of hip, stylish apparel that appeals to all kinds of girls (and to their moms and dads!) Our line of sweet and sassy sportswear and sleepwear for girls not only features the hottest colors and trendy styles, it also incorporates the extra soft comfort that made Just Love Fashion famous. From the moment she wakes up until she lays her head down at night, Just Love has the perfect clothing for your perfect princess. When you browse our girls fashions, you’ll find great options for playtime, school, family outings, and restful nights. And you’ll feel good knowing that every piece of clothing at Just Love is designed to be exceptionally comfortable. Our designs use stretchy fabrics that are easy for kids to pull on and off, so getting dressed is simple. We also use simple zippers and flexible elastic waists, so children find it easy to dress themselves. And to make sure your child loves wearing our clothes, we insist that every fabric we use is soft to the touch and stays soft wash after wash. So, whether you’re looking for hip and trendy designs or simple childhood favorites, we’ve got tops, shorts, dresses, footed pajamas, pajama sets, and jackets that will make your child smile. Every delightful selection is supremely comfy and affordably priced. If you’re looking for fun girls clothing on a budget, but also demand well-made, long-lasting apparel, Just Love has lots of great choices for you. After all, every piece of affordably-priced Just Love clothing is designed to withstand constant laundering. That means Just Love girls clothing and pajamas won’t fade or shrink. And they’re made with quality craftsmanship, so seams won’t fall apart, and loose threads won’t be an issue. But best of all, these soft fabrics stay soft. At Just Love, we work hard to create fun fashion that is durable AND affordable. Parents love our clothes because they fit their budget. Girls love our clothes because they fit their lifestyle. If you’ve been searching for trendy girls apparel that’s long-lasting and priced right, you’ve been searching for Just Love. Hip n trendy, pretty n stylish, adorable n supremely comfy, our girl’s clothing is all about making your little lady smile all the way. We have everything from lounge pants, pajama sets, short sets, to so much more that’s designed in eye-catching color and extra-cute detailing.